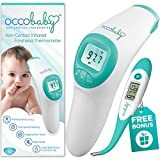 Safely and effectively eliminate 99.9 percent of most household germs in as little as two minutes. 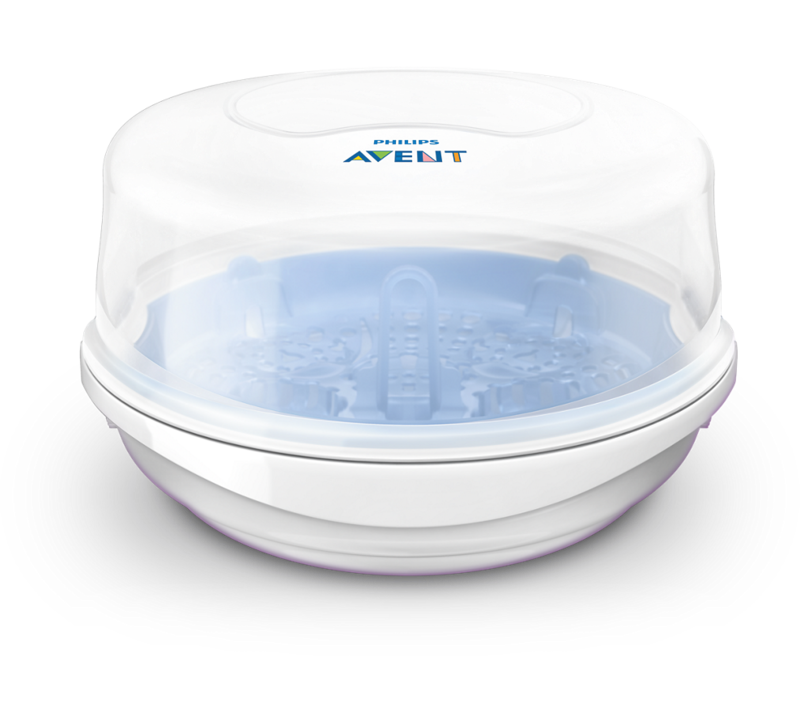 The Philips AVENT Microwave Steam Sterilizer kills 99.9 percent of harmful germs in 2 minutes*. 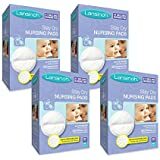 It is compact and lightweight and can keep contents sterile for 24 hours if the unit remains unopened. 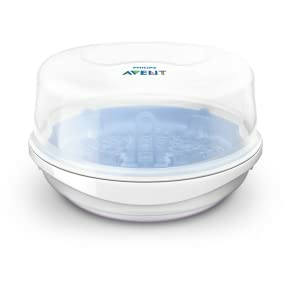 Operating at a higher temperature than a dishwasher, the Philips AVENT Microwave Steam Sterilizer uses the power of your microwave oven to sterilize. Just add water and place in the microwave for 2 minutes*. Safety clips keep the lid securely closed and side grips stay cooler for safe handling. *Sterilization requires two minutes at 1,100 to 1,850 watts, four minutes at 850 to 1,100 watts, and six minutes at 500 to 850 watts. 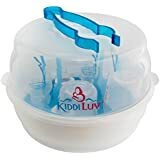 Lockable clips ensure that the contents remain sterile for up to 24 hours after microwaving when the lid remains unopened. 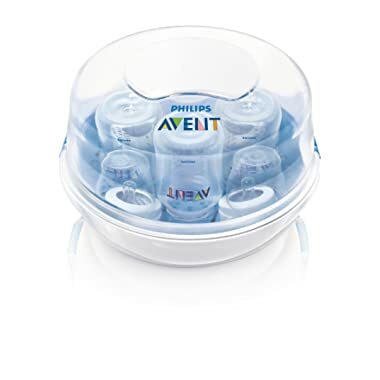 At full capacity, the Philips AVENT Microwave Steam Sterilizer holds up to four 9-ounce or two 11-ounce Classic or Natural Philips AVENT bottles. 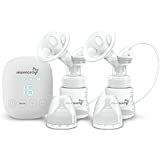 Its interior rack can also support two Philips AVENT breast pumps (non-electrical components only) and up to four breast milk storage cups and lids. 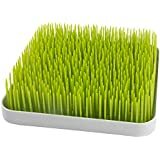 You can use it to sterilize pacifiers, non-metal utensils, and other microwave-safe baby items. 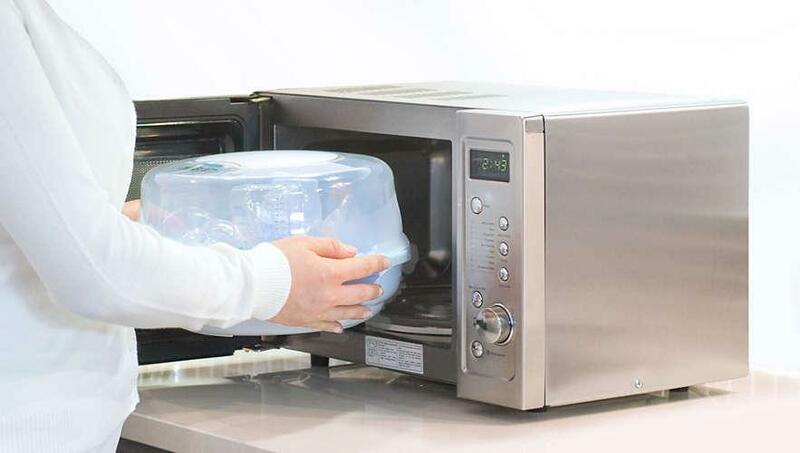 Measuring 6.5 by 11 inches, the Philips AVENT Microwave Steam Sterilizer's compact size fits in most microwave ovens. And because it is lightweight and portable, it's also great for traveling. 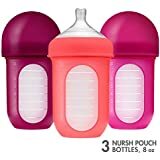 Use your regular bottles and accessories while on overnight trips, knowing they are germ-free and safe for your baby. 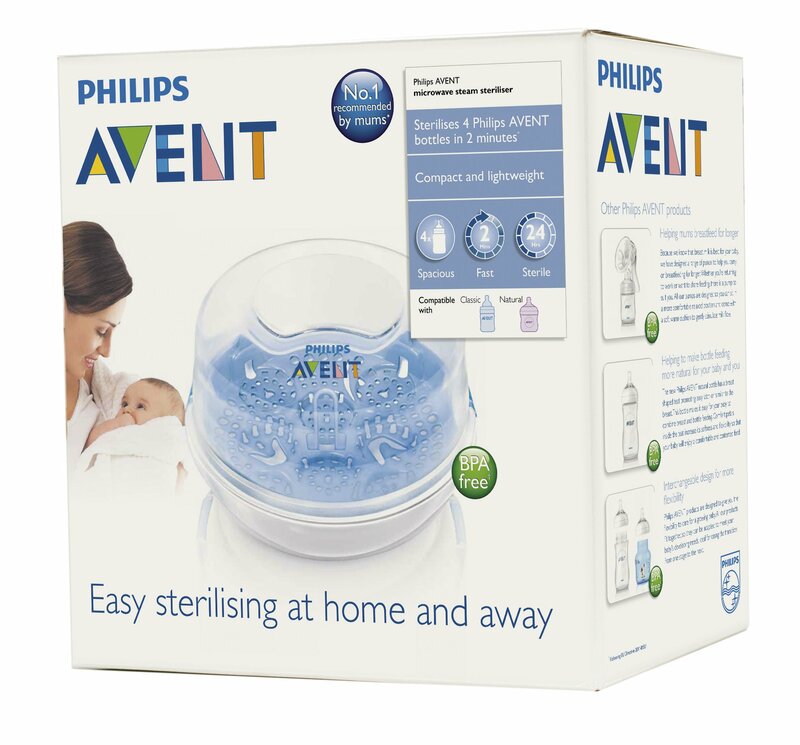 The Philips AVENT Microwave Steam Sterilizer is BPA free and is backed by a one-year limited warranty. One Philips AVENT Microwave Steam Sterilizer, one steam tray, one set of tongs, and instructions. 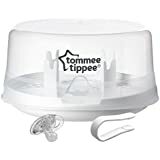 Stay cool safety clips to keep lid secure: The microwave steam sterilizer has stay cool safety clips to keep the lid secure. 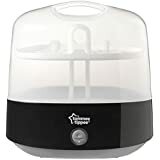 This ensures you can remove the sterilizer safely from the microwave, keeping baby bottles and other products sterile and preventing the possibility of burning. 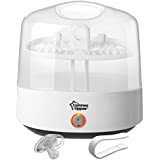 Sterilizes pumps, soothers, cutlery as well as baby bottles: The sterilizer can be used to sterilize breast pumps, soothers, cutlery and other products as well as baby bottles. 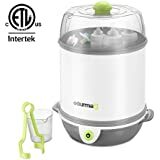 Microwave steam sterilizer ready in just 2 minutes: The microwave steam sterilizer can be used to sterilize baby bottles and other products in just 2 minutes. The exact length of the cycle depends on the wattage of your microwave, of course. 2 minutes at 1200-1850W, 4 minutes at 850-1100W, 6 minutes at 500-800W. 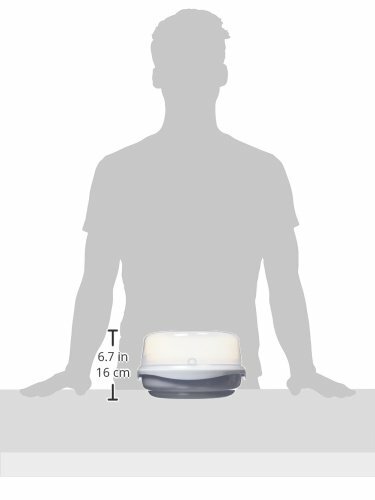 Contents stay sterile for up to 24 hours: Contents remain sterile for up to 24 hours if the lid is unopened. 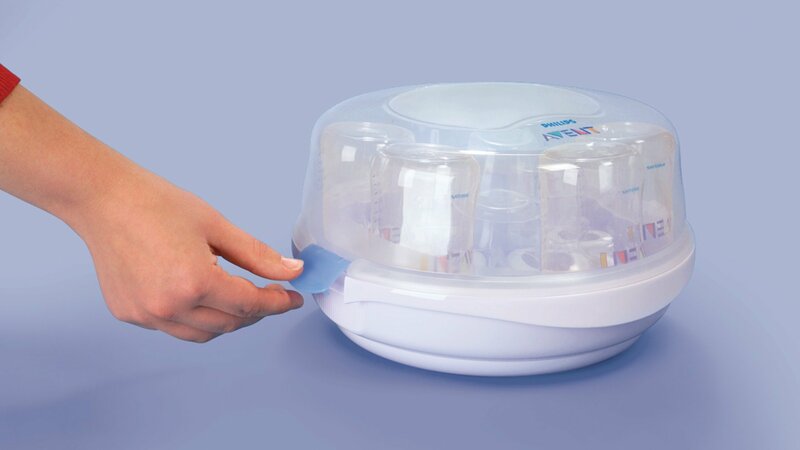 terilizes standard neck and wide neck baby bottles: The sterilizer sterilizes standard neck and wide neck baby bottles. 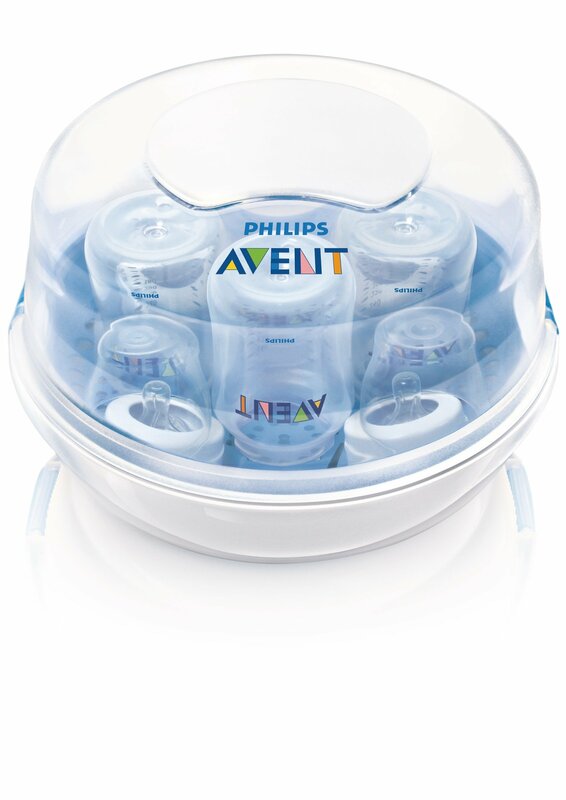 Up to 4 Philips Avent baby bottles can be sterilized at once. 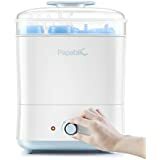 Lightweight design for sterile baby bottles on the go: The sterilizer's lightweight and compact design makes it easy to take along with you wherever you go - holidays, visits to relatives etc. Now you can always have sterilized baby bottles and other products within easy reach.